Representative of the Maranos in 1482, and a wealthy tax-farmer; lived in Jerez de la Frontera. 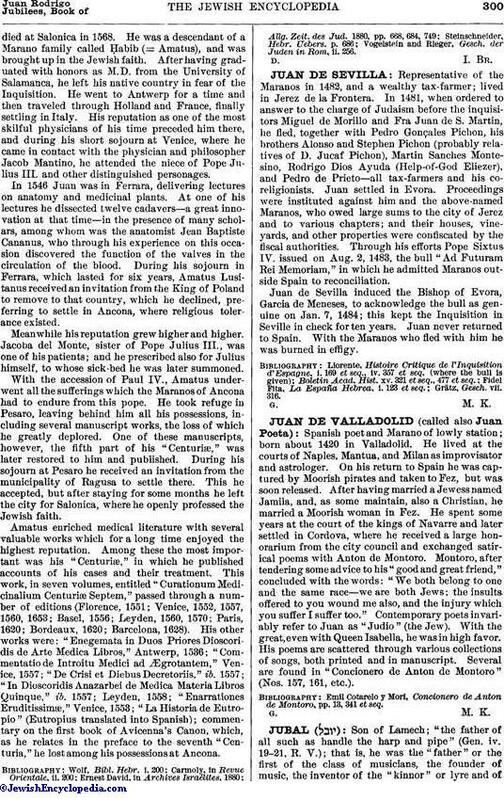 In 1481, when ordered to answer to the charge of Judaism before the inquisitors Miguel de Morillo and Fra Juan de S. Martin, he fled, together with Pedro Gonçales Pichon, his brothers Alonso and Stephen Pichon (probably relatives of D. Juçaf Pichon), Martin Sanches Montesino, Rodrigo Dios Ayuda (Help-of-God Eliezer), and Pedro de Prieto—all tax-farmers and his coreligionists. Juan settled in Evora. Proceedings were instituted against him and the above-named Maranos, who owed large sums to the city of Jerez and to various chapters; and their houses, vineyards, and other properties were confiscated by the fiscal authorities. Through his efforts Pope Sixtus IV. issued on Aug. 2, 1483, the bull "Ad Futuram Rei Memoriam," in which he admitted Maranos outside Spain to reconciliation. Juan de Sevilla induced the Bishop of Evora, Garcia de Meneses, to acknowledge the bull as genuine on Jan. 7, 1484; this kept the Inquisition in Seville in check for ten years. Juan never returned to Spain. With the Maranos who fled with him he was burned in effigy.